A version of this essay appeared in the January 2019 issue of First Things. You can read the original here. The present moment is one of growing discomfort, both in America and in Europe, with the regnant liberal political theory often described as liberal democracy. It is frequently said that the only genuine alternatives to liberal democracy are Marxism and Fascism, but I don’t believe this is true. I want to sketch an alternative viewpoint that I will call conservative democracy. This position is closer to the spirit of traditional constitutionalism in both America and Britain than the liberal political theories of our day. Moreover, it is far better equipped to maintain the free institutions of these nations than liberalism. There are prominent scholars and public figures who are convinced that “things are getting better” in almost every way. As for me, I find it difficult not to see the Western nations disintegrating before our eyes. The most significant institutions that have characterized America and Britain for the last five centuries, giving these countries their internal coherence and stability—the Bible, public religion, the independent national state, and the traditional family—are not merely under assault. They have been, at least since the Second World War, in precipitous decline. In the United States, for example, some 40 percent of children are today born outside of marriage. Overall fertility rate has fallen to 1.76 children per woman. American children for the most part receive 12 years of public schooling that is scrubbed clean of God and Scripture. And it is now possible to lose one’s livelihood or even to be prosecuted for maintaining traditional Christian or Jewish views on various subjects. The present revival of nationalist sentiment in Britain and America seeks, in one way or another, to resist this trajectory. Perhaps 70 percent of President Trump’s votes came from Evangelical Christians and conservative Catholics, and a similar pattern of support for the parallel “Brexit” movement seeking independence from the European Union can be observed in the UK. I know that some conservative intellectuals are inclined to see Brexit and the Trump movement as signs of the disease at least as much as harbingers of a coming recovery. Nonetheless, I think it is undeniable that a vast Christian public in these countries (as well as the great majority of Orthodox Jews) recognizes in the current nationalism an attempt to avert the complete collapse of the traditional Western order. What we see before us, then, is a contest between two powerful movements—a “liberal” movement that has been dominant for some time, and a nationalist movement that openly seeks to resist it. In public discourse today, the existence of these two camps is seen clearly. But what they each stand for is not so clear. I will try to bring what is at issue between these rival camps into greater focus. I take “liberalism” to refer to an Enlightenment political tradition descended from the principal political texts of rationalist political philosophers such as Hobbes, Locke, Spinoza, Rousseau and Kant, and reprised in countless recent works of academic political theory elaborating these views. By “rationalist,” I mean that this kind of political thought is intended to imitate a mathematical system, which begins with axioms taken to be self-evident and proceeds by supposedly infallible deductions. Availability and Sufficiency of Reason. Human individuals are capable of exercising reason, which “teaches all mankind who will but consult it” (as Locke puts it). By reasoning, they are able to discover universal truths that hold good across all human societies and in every historical time frame. The Free and Equal Individual. Human individuals are by nature “perfectly free” and “perfectly equal” (as Locke puts it). Obligation Arises From Choice. Human individuals have no obligations to political institutions until “by their own consent they become members of some political society” (as Locke puts it). These three fundamental axioms are important not only for understanding a certain stream of early-modern political rationalism. The axioms of the liberal-rationalist system have continued to dominate discourse wherever liberalism has advanced in Europe and America up until our own day. Attempts to alter these foundations of liberalism are well known (consider Mill or Hayek). But they have ultimately been of little consequence. It is these Lockean assumptions that continue to characterize liberal discourse, and if anything they have only received an even greater emphasis in recent years. Now, the fact that conservative political institutions such as religion, family, and the national state derive from sources external to liberalism is not, in principle, fatal. In theory, one can imagine a world in which liberalism co-exists with the sources of religion and nationalism—and even that these might be complementary to liberalism, providing it with crucial resources that it itself cannot generate. This is, implicitly, the strategy of those liberals who say that liberalism is “only a form of government designed to permit a broad sphere of individual freedom.” On this view, liberalism has no aim and no consequences other than to ensure that no one is coerced, for example, into becoming a Christian; or that no one is coerced into conducting his personal life within the framework of a traditional family. These things, it is said, can be relegated to a separate sphere of privacy and personal liberty—a sphere in which religious tradition, national cohesion, and the family, will flourish, even as liberal premises are made the official governing doctrine of the state. But I think that this proposal has by now been empirically refuted. Both in Europe and in America, the principles of liberalism have not brought the flourishing of religious tradition, national cohesion, and the family—but the opposite. Everywhere it has gone, the liberal system has brought about the dissolution of these fundamental traditional institutions. Nor is the reason for this hard to find. For liberalism is not “only a form of government designed to permit a broad sphere of individual freedom.” In fact, liberalism is not a form of government. It is system of beliefs taken to be axiomatic, from which a form of government can, supposedly, be deduced. In other words, it is a system of dogmas. About what? About the nature of human beings, reason, and the sources of the moral obligations that bind us. This means that liberal dogmas concern many of the same subjects that are at the heart of biblical political thought. However, liberal dogma offers a very different view from that of, for instance, the Hebrew Bible: Whereas Hebrew Scripture depicts human reason as weak, capable only of local knowledge, and generally unreliable, liberalism depicts human reason as exceedingly powerful, offering universal knowledge, and accessible to anyone who will but consult it. Similarly, whereas the Bible depicts moral and political obligation as deriving from God and inherited by way of family, national and religious tradition, liberalism makes no mention of either God or inherited tradition, much less specific traditional institutions such as the family or nation. And while the Bible teaches that all are created in the image of God, thus imparting a certain dignity and sanctity to each human being, it says nothing about our being by nature perfectly free and perfectly equal. Thus there are no grounds for the claim that liberalism is merely a system of “neutral” rules, a “procedural” system that can make traditional political and religious structures work all the better while leaving them in tact. Liberalism is a substantive belief system that provides an alternative foundation for our views concerning the nature of human beings, reason, and the sources of the moral obligations that bind us. This alternative foundation has not co-existed with earlier political tradition, rooted in the Bible, as we were told it would. It has rather cut this earlier tradition to ribbons. For example, the liberal belief that reason is powerful, universal and reliable has meant that there is, in principle, no need to consult with national and religious tradition, or even to accord such traditions honor and respect. Private individuals can toy with such things if they so choose. But public life can be conducted perfectly well without them. The word “conservative” is usually used as a synonym for “traditionalist”: A conservative is someone who strives to defend and build up the political and intellectual traditions of his or her own tribe or nation. Of course, this doesn’t mean that a conservative needs to defend every last foolish thing that has ever been part of the tradition. Every political tradition undergoes adjustments over a time. But if a change is going to be made, then a conservative would like to see such repairs made on the basis of principles internal to the existing order—and always with an eye to strengthening the unique structure of the political order as a whole. This means that conservatism is not something like Marxism or liberalism—both of which are universal theories that propose a single answer to the question of the political good for all nations everywhere on earth and at all times in history. Unlike these universalist theories, there can be as many different conservatisms as there are national and tribal traditions. There are conservative traditions in China or India, Russia or Germany that are radically different from ours—and maybe there are certain things that are attractive about each of them, or maybe not. But as a conservative I’m not committed to defending them all, nor should you be either. Historical Empiricism. The authority of government derives from constitutional traditions known, through the long historical experience of a given nation, to offer stability, wellbeing and freedom. These are refined through trial and error over many centuries, with repairs and improvements being introduced where necessary, while seeking to maintain the integrity of the inherited national edifice as a whole. Such historical empiricism entails a skeptical standpoint with regard to the divine right of the rulers, the universal rights of man, and all other abstract, universal systems. Written documents express and consolidate the constitutional traditions of the nation, but they can neither capture nor define this political tradition in its entirety. Religion. The state upholds and honors the biblical God and religious practices common to the nation. These are the centerpiece of the national heritage and indispensable for justice and public morals. At the same time, the state offers wide toleration to religious and social views that do not endanger the integrity and wellbeing of the nation as a whole. Limited Executive Power. The powers of the king (or president) are limited by the laws of the nation, which he neither determines nor adjudicates. The powers of the king (or president) are limited by the representatives of the people, whose advice and consent he must obtain both respecting the laws and taxation. Individual Freedoms. The security of the individual’s life and property is mandated by God as the basis for a society that is both peaceful and prosperous, and is to be protected against arbitrary actions of the state. The ability of the nation to seek truth and conduct sound policy depends on freedom of speech and debate. These and other fundamental rights and liberties are guaranteed by law, and may be infringed upon only by due process of law. These principles can serve as a summary of the Anglo-American conservative tradition that was the basis for the restoration of the English constitution in 1689; and for the American restoration, which took place upon the ratification of the American constitution of 1787 after twelve years of disarray. These same principles have continued to underpin subsequent conservative political tradition in Britain, America, and other nations down to our own time. Liberalism, as has been said, is a political doctrine based on the assumption that reason is everywhere the same, and accessible, in principle, to all individuals; and that one need only consult reason to arrive at the one form of government that is everywhere the best, which has recently been given the name liberal democracy. This term was apparently first popularized in central Europe in the 1920s, and attained a dominant position in political discourse in the English-speaking world only in the 1990s. What is meant by this term is a form of government that borrows certain principles from the earlier Anglo-American conservative tradition, especially those limiting executive power and guaranteeing individual freedoms (Principles 4 and 5 above). But liberal democracy breaks with earlier Anglo-American political tradition in regarding these principles as having been derived from liberal axioms, and for this reason detachable from the broader Anglo-American tradition in which they historically arose. Liberals thus tend to have few, if any, qualms about discarding the national and religious foundations of Anglo-American government (Principles 2 and 3), seeing these as unnecessary, if not simply contrary to universal reason. In their campaign for universal “liberal democracy,” liberals have thus confused certain historical-empirical principles of the traditional Anglo-American constitution, painstakingly developed and inculcated over centuries (Principle 1), for universal truths that are equally accessible to all human beings, regardless of historical or cultural circumstances. This means that, like all rationalists, liberals are engaged in applying local truths, which hold good under certain conditions, to quite different situations and circumstances where they often go badly wrong. For conservatives, these failures—for example, the repeated collapse of liberal constitutions in places such as Mexico, France, Germany, Italy, Nigeria, Russia, and Iraq, among many others—suggest that the principles in question have been overextended, and should be regarded as true only within a narrower range of conditions. Liberals, on the other hand, tend to see such failures as resulting from “poor implementation,” leaving liberal democracy as a universal truth that is untouched by experience, and unassailable no matter what actually happens. This means that what is now called “liberal democracy” refers not to the traditional Anglo-American constitution, but to a rationalist reconstruction of it that has been detached from Protestant religion and the Anglo-American nationalist tradition. Far from being a time-tested form of government, this liberal-democratic ideal is something new to both America and Britain, establishing itself as authoritative only in recent decades. Traditionally, Americans referred to their form of government as republican government. Indeed, insofar as usage is concerned, the term “liberal democracy” does not become more common in public discussion than the traditional term “republican government” until the 1960s. And it does not achieve its present dominant position in discourse on forms of government (overwhelming even the expression “democratic government”) until the 1990s. This shift in language is not arbitrary, but reflects a profound reconfiguration at the level of ideas as well: A reconfiguration of what kind of government is considered desirable and legitimate. Roughly speaking, the dominant position of the term “republican government” corresponds to the period in which the Anglo-American conservative tradition remained to some significant degree in tact, and so was able to serve as a bulwark against too great a penetration of liberal axioms into public life. A state cannot, consistently with the First and Fourteenth Amendments, utilize its public school system to aid any or all religious faiths or sects in the dissemination of their doctrines and ideals. Looking back, we can recognize that this was not an isolated decision. It was rather an early indication of the turn that would put an end to the old republican conception of the United States, establishing among its elites the alternative conception now known as “liberal democracy”— a form of regime that recognizes only liberal principles as the basis for the legitimacy of the state; and withdraws its concern and sanction from the religious, national, and historical-empiricist principles that had for many centuries held such a prominent place in the Anglo-American constitutional tradition. The claim that liberal-democratic regimes of this kind can be maintained for long without the conservative principles they have discarded is a hypothesis now being tested for the first time. Those who believe that a favorable outcome of this experiment is assured draw this conclusion not from historical or empirical evidence, for we have none. Rather, their confidence derives from the closed Lockean-rationalist system that holds them captive, preventing them from being able to anticipate any of the other quite possible outcomes before us. There is, then, in recent Western tradition, at least one well-developed alternative to liberalism that is neither Marxist nor Fascist. This is the Anglo-American conservative tradition. I do not mean to endorse every evil that was tolerated under the old republicanism in the United States—the institutionalized abuse of the African-American minority being the most obvious example of something we should be very pleased to do without. But I do believe that it is possible to think in terms of what might now be called a conservative democracy. Such a political model would reject the axioms of the liberal-rationalist system, and would instead be concerned to maintain a balance between the principles of limited government and individual liberties, on the one hand; and the principles of religion, nationalism, and historical empiricism that had maintained free government in Britain and America for centuries, on the other. 1. Public Religion. Liberalism suggests that universal reason is the necessary and sufficient basis for just and moral government. This means that religious and national tradition, which had earlier been the basis for a public understanding of justice and right, can be replaced in public discourse by universal reason itself. A conservative-democratic view holds that none of this is true. Conservatives see human reason as producing a constant profusion of ever-changing views concerning justice and morals—a fact that is evident today in the constant assertion of new human rights. Conservatives hold that the only stable basis for national independence, justice, and public morals is a strong biblical tradition in government and public life. The liberal doctrine requiring a “wall of separation between church and state” at all levels of government is, as has been said, a product of the post-Second World War period, and not an inherent feature of American political tradition. 2. Law. Liberals regard the laws of a nation as emerging from the tension between positive law and the pronouncements of universal reason, as expressed by the courts. Conservatives reject the supposed universal reason of judges, which often amounts to little more than acceding to passing fashion. But conservatives also oppose an excessive regard for isolated written documents, which leads, for example, to the liberal mythology of Americans as a “creedal nation” (or a “propositional nation”), defined solely by certain abstractions found in the American Declaration of Independence or the Gettysburg Address. Important though these documents are, they cannot substitute for the Anglo-American political tradition as a whole, with its roots in the English common law and going back to Scripture, which alone offers a complete picture of the English and American legal inheritance. 4. Economy. Liberals regard the universal market economy, operating without regard to borders, as a dictate of universal reason and applicable equally to all nations. They therefore recognize no legitimate economic aims other than the creation of a “level playing field” on which all nations participate in accordance with universal, rational rules. Conservatives regard the market economy and free enterprise as indispensable for the advancement of the nation in its wealth and wellbeing. But they also recognize the corrosive effects of the market on traditional institutions based on mutual loyalty, including the family, the nation, and religious tradition. Moreover, conservatives see economic arrangements as inevitably varying from one country to another, reflecting the particular historical experiences and innovations of each nation as it competes to gain advantage for its people. 5. Immigration. Liberals believe that since liberal principles are accessible to all, there is nothing to be feared in large-scale immigration from countries with national and religious traditions very different from our own. Conservatives see successful large-scale immigration as possible only where the immigrants are strongly motivated to integrate, and assisted in assimilating the national traditions of their new home country. In the absence of these conditions, the result will be chronic inter-cultural tension and violence. 6. Liberal Empire. Because liberalism is thought to be a dictate of universal reason, liberals tend to believe that any country not already governed as a liberal democracy should be pressed, and at times even coerced, to adopt this form of government. Conservatives, on the other hand, recognize that different societies are held together and kept at peace in different ways, so that the universal application of liberal doctrines often brings collapse and chaos, doing more harm than good. 7. International Bodies. Similarly, liberals believe that since liberal principles are universal, there is little harm done in re-assigning the powers of government to international bodies. Conservatives, on the other hand, believe that such international organizations possess no sound governing traditions, and no loyalty to particular national populations that might restrain their spurious theorizing about universal rights. They therefore see such bodies as inevitably tending toward arbitrariness and autocracy. In sketching these principles for conservative democracy, I have not proposed that changes should be made in any written constitutional documents. For the truth is that neither the U.S. Constitution nor the principal constitutional documents in Britain explicitly endorse liberal doctrines, and so it must be admitted that these documents are not the source of the troubles these nations are facing today. The real problem is that American and British elites, like their European counterparts, are dogmatically committed to rationalist-liberal axioms as the sole legitimate basis for government, and have set about reconstructing public life in light of these beliefs—regardless of the actual contents of the Anglo-American constitutional inheritance. For example, there is nothing in the American Constitution that forbids teaching Bible in schools. Even under the present liberal construction of the law, it is not now illegal to teach Bible in American public schools. The Supreme Court seems to allow teaching the Bible as history, literature, or philosophy. Yet most public schools offer no such courses. The problem is far less the law as it stands than the assumptions of an Enlightement culture, which is hostile to Bible education and does not want to see it in the schools. Indeed, this same culture is responsible for the fact that philosophically and theologically substantive courses in the Bible are largely avoided in the universities as well, even though no legal impediments stand in the way of offering them or even requiring them. Similarly, the United States Supreme Court has, since 1992, permitted itself to make decisions on the basis of what it calls a “right to define one’s own concept of existence, of meaning, of the universe” (in the words of Justices Kennedy, Souter and O’Connor in Planned Parenthood v. Casey ). In so doing, the court takes Jefferson’s assertion of a universal right to “liberty and the pursuit of happiness” in the Declaration of Independence and establishes it as a kind of ultimate standard against which all things in society are to be judged. Again, it is not the Constitution itself that is the problem, nor even, necessarily, the existence of such Enlightenment-rationalist phrases in the Declaration of Independence. The actual problem is the fact that the judges, interpreting the world from within the intellectual straitjacket of the liberal axiom system, are longer capable of giving any real weight to the empirical reality of the American nation, with its historical commitments to the Bible, Christian religion, and the common law of England and America. Perhaps democracy would be strengthened if its written constitutional documents were designed to protect the particularlity of the nation and its traditions. But as these examples suggest, it is not primarily the written documents that make a democracy conservative. The trauma of the Second World War persuaded America, Britain and other nations to adopt a closed system of Enlightenment-rationalist principles—liberalism—as the sole foundation for public life and moral obligation. Eventually, the political traditions of these nations were even renamed “liberal democracy” as an indication that henceforth only Enlightenment-rationalist principles would be considered legitimate as the basis for political discourse. But liberal principles provide no resources for maintaining institutions such as the national state, the family, and Christian or Jewish religion. Having displaced the older biblical worldview that had given these institutions life, liberalism has in the course of a few generations severely damaged all of them. The current political reality of disintegrating national states, ruined families, and eviscerated religious traditions is the direct consequence of the embrace of liberal dogma as a kind of universal salvation creed throughout much of the West. At this point, liberalism is widely accepted as a substitute for tradition, wisdom, and empiricism—which is another way of saying that it has replaced competent reasoning as well. Many can now see that the nations of the West are hurtling toward an abyss. I have offered a sketch of what it would mean to back away from it. I have suggested that there is no need for a revolutionary revision of the great constitutional documents of the Anglo-American political tradition. But the liberal axiom system must be set aside: We must cease to consider it the source of our political institutions. We must stop teaching it as a dogma to our children. And we must retrieve older traditions of Anglo-American political thought, which may yet be revived as a political model than can be called conservative democracy. 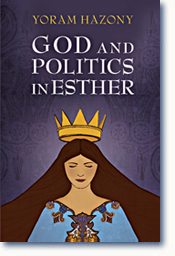 Order God and Politics in Esther now. To follow the debate about the book by email, click here.